My daughter and I were snacking on some Goldfish Pretzels last week when I asked her where she thought they would like to swim. “In chocolate?” was her response and this gave me an idea. After a trip to the grocery store, we decided to test her theory out with fudge. I mean, I would like to swim in fudge, so surely these cute little pretzel fish would like to as well. This was an easy recipe to make and my oldest, at four years old, was able to help with everything except for chopping the walnuts. Melt both chocolate chips and condensed milk together either over the stove or in the microwave. Be careful not to over cook the mixture or it will begin to dry out. Stir in vanilla and chopped walnuts. Line a small lipped square dish with wax paper and put mixture in dish. Spread mixture to the sides and even it out on top. 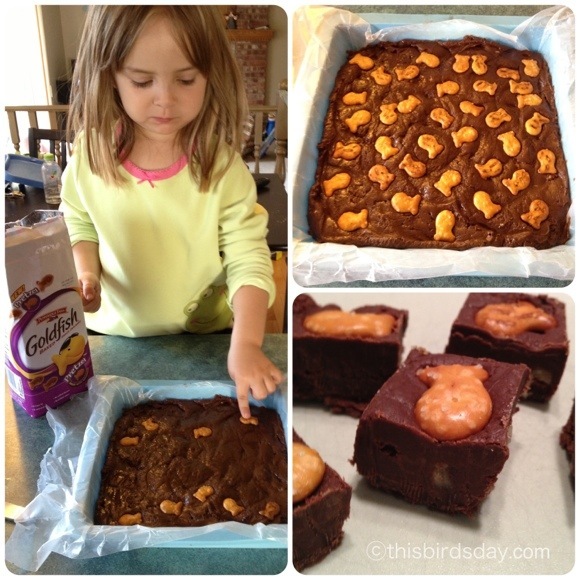 Put as many Goldfish Pretzels as you like on top and press lightly so they stick to the fudge. If you stir the pretzels in to the mixture they will become soft if you end up storing it after one day. Put dish in fridge for a few hours to set. Then remove, cut into portions and store in fridge. These also store really well in the freezer. Enjoy! Disclaimer: I am working with Goldfish, but this post is not a requirement. We just had a great time and I wanted to share the recipe and the idea. It is tagged with the hashtag because of relevance to the topic.